The Cork Mother Jones Committee received an enormous number of messages of support for the recent Spirit of Mother Jones Festival from around the world. 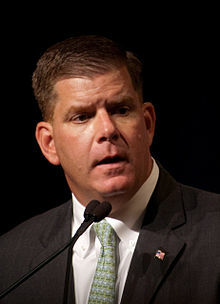 Among those received was the following message of support from Martin J Walsh, Mayor of Boston. 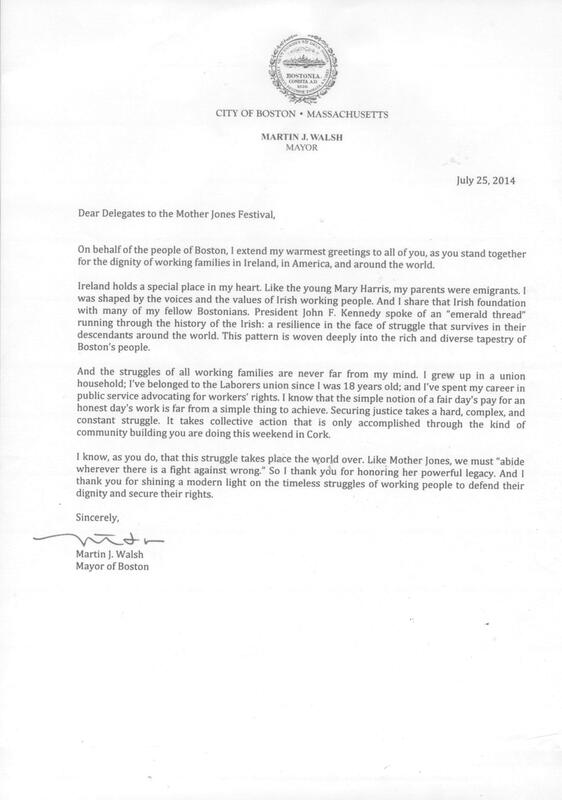 We are delighted to have received this message of support for the Spirit of Mother Jones Festival and wish to thank Mayor Walsh for his kind message. On behalf of the people of Boston, I extend my warmest greetings to all of you as you stand together for the dignity of working families in Ireland, America, and around the world. Ireland holds a special place in my heart. Like the young Mary Harris, my parents were emigrants. I was shaped by the voices and values of Irish working people. And I share that Irish foundation with many of my fellow Bostonians. President John F. Kennedy spoke of an “emerald thread” running through the history of the Irish: a resilience in the face of struggle that survives in their descendants around the world. This pattern is woven deeply into the rich and diverse tapestry of Boston’s people. And the struggles of all working families are never far from my mind. I grew up in a union household; I’ve belonged to the Laborers union since I was 18 years old; and I’ve spent my career in public service advocating advocating for workers’ rights. I know that the simple notion of a fair day’s pay for an honest day’s work is far from a simple thing to achieve. Securing justice takes a hard, complex, and constant struggle. It takes collective action that can only be accomplished by the kind of community building you are doing this weekend in Cork. I know, as you do, that this struggle takes place the world over. Like Mother Jones, we must “abide wherever there is a fight against wrong”. So I thank you for honoring her powerful legacy. And I thank you for shining a modern light on the timeless struggles of working people to defend their dignity and secure their rights.